Walking through certain neighborhoods in NYC you’re guaranteed to come across a pop-up shop or two. They could be selling anything from vintage clothes to frozen yogurt. Big brands like to use pop-up shops to spark temporary activation in an area, often serving as an in-person, physical presence surrounding a bigger marketing campaign. But where did this trend start and how do we know if it’s working? Trendsetting.com claims to have dubbed the term back in 2004 to describe highly anticipated retail shops that would appear, draw in a ton of traffic, and then morph into something different when the hype fades. Like most trends, this one began because of an over-abundant resource and people savvy enough to recognize the opportunity. There is an excess of retail space. Companies like Storefront claim that 1 in 10 retail stores are vacant and want to be the Airbnb for short-term retail renters. As pop-up shops become more mainstream, the process of finding the right space for the brand gets easier and easier. Storefront is responsible for over 1,000 pop-up shop bookings in a little over a year and certain communities are actively recruiting pop-up business to their neighborhoods. They’ve expanded from just retail to other products and beyond to events, classes, and co-working. One of the best uses of pop-up shops is for businesses that experience extreme seasonality. For example, halloween costume retailers can arrive at the beginning of October and do a month’s worth of steady business before moving on. And finally, pop-up shops embody something we believe strongly in here at SquadUP– instead of just creating an event you need to share an experience. 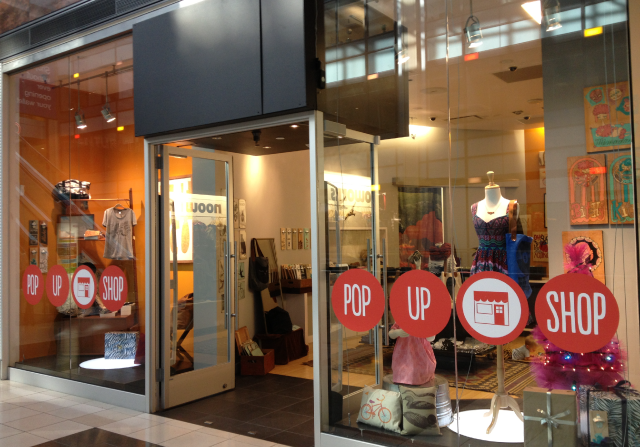 Pop-up shops are a unique form of experiential marketing. They’re unexpected and ephemeral, making people feel like they’re lucky to have discovered this new opportunity while it lasts. Many brand exist mostly online and a pop-up shop can be the physical presence they’re looking for to complement their online image. An experience where customers can see and touch product while talking to live company representatives can do a lot to personalize a brand. Pop-up shops aren’t the right solution for every marketing campaign. But hopefully this will shed some light on the benefits and why they’re so hot right now, especially in NYC, San Francisco, and Los Angeles. Comment on this post or tweet @squadup to continue the discussion.